After realizing there were also...questions...about the cost per jump for passengers, and not just bulk cargo, and also finding that the layout did not work on my tablet, I've made some additional updates to the version. 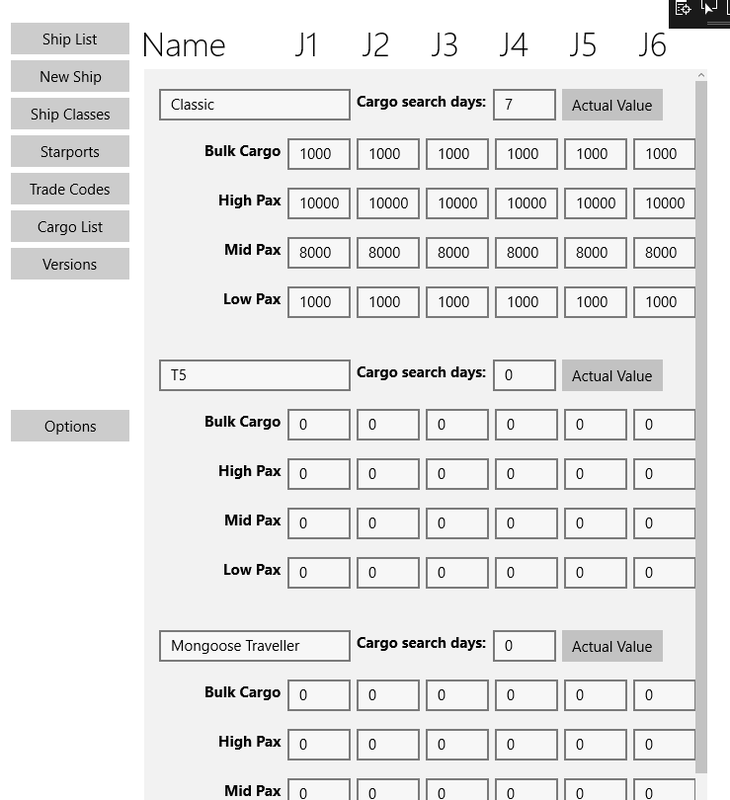 I've added the cost per passage by jump, and updated the math involved so that adding passengers as well as cargo should use the cost that is assigned to the ship's version. 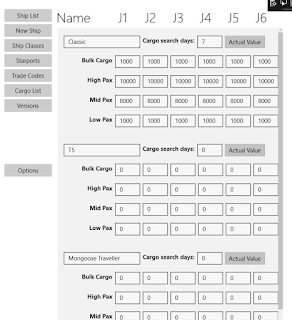 Not entirely liking my approach: I almost went the way of adding yet another table that would have the cost, the jump distance, and what it was (high, mid, low, bulk cargo), as well as the version ID. It would have allowed for jumps more than 6 if you allow that as well as streamlining the tables. But it also makes the UI more complicated in some ways. So each version would have, out of the box, 6 (jump ranges) x 4 (cargo, high, mid, low pax) associated records. I went this route for the actual value table - there are 14 actual value records per version (they get created at 100% when you load a version the 1st time). So it could have been done to make it more flexible (I would then add another field to the version to indicate max jump range, rather than the default 6 with the hardcoded fields). I really hate hard-coded fields - they box you in. I may still go that route, but as this is not enterprise level software, I probably won't. Tracker - now with images!